Let’s build the wellness community we want to be a part of—together. At Dia&Co, we believe that fitness is the next frontier for size inclusivity. The images we see in society would lead you to believe that the role of women above size 14 is to serve as a “before” picture — but we know that couldn’t be further from the truth. Our community members, like all women, are leading active lives and pursuing a wide range of holistic wellness goals, from improving overall health to reducing stress. Contrary to pervasive stereotypes, interest in wellness does not stop at a specific size. Unfortunately, those of us in plus-size bodies often face unwelcoming wellness environments. From nonstop weight loss and diet messaging to pointed comments from fellow gym-goers, the wellness space can be toxic. Our community deserves better. That’s why we’re launching a new wellness community group: to show the world what a positive, inclusive, and representative fitness community looks like. We’ve enlisted the help of top wellness experts—who are members of this community themselves, and who understand firsthand the experience of navigating these spaces as a plus size woman. A body-positive environment. We promise to never promote diet talk or weight loss discussions. 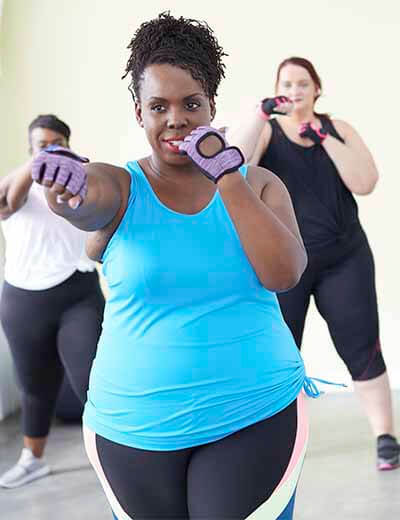 While we understand that weight loss may be a personal goal for some, our community is focused on the things we gain from being active: from strength to energy to confidence to new friendships. We firmly believe that all bodies are good bodies, and want to ensure that we maintain a body-positive space for our community members to feel respected and safe. A holistic approach. We believe that wellness is all-encompassing. Mental health, self-care, physical fitness, nutrition, confidence: all of these things make up wellness. Activities like meditation can impact your wellness just as much as running or swimming. If it makes you feel well, it falls under the wellness category. Tips from experts. Each month, we will focus on a unique activity that challenges the body and mind. An expert from that field, be it hiking or meditation or dance just to name a few, will create weekly challenges for the community and will be present in regular check-in videos offering encouragement and support along the way. Support to achieve your goals. We believe that you know your body best, and you know what goals are right for you. We’re here to cheer you on—and to provide a platform to help like-minded women connect and share their wellness journey with each other. Ready to try something new? Check out the Dia&Co Wellness Community. No matter where you are on your wellness journey, you’ll find someone to support you—and someone you can support.